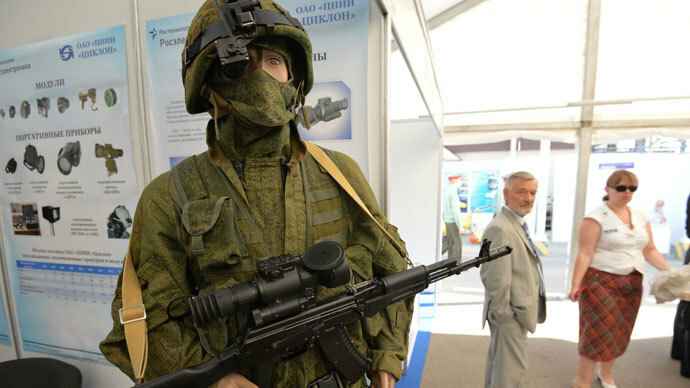 Cutting-edge military equipment and hardware – some of it too secret for the public eye – was featured at the Russian Defense Ministry’s Innovation Day fair in Moscow. Androids, drone prototypes, and thin impenetrable armor were revealed to visitors. More than 260 design bureaus, research institutes, and student labs presented their pet projects during the Tuesday fair. The ground-breaking technologies were often described as bearing hallmark Russian features – smart, reliable, and robust. While the US is considered to be world’s drone leader, boasting a fleet of combat UAVs, each of these machines are costly for the country’s military budget. Such limitations did not hinder Russian students from the Moscow Aviation Institute (MAI), who designed a low-cost, easy-to-use unmanned attack helicopter. The rotorcraft drone prototype, dubbed “Raven-333” in the MAI, has a simple robust design, but it can actually be turned into a deadly remote-controlled machine equipped with a Kalashnikov assault rifle and grenade launcher. It also comes with thermo visors, gas, and hyperspectral sensors to detect targets within a 10km radius. Russia’s prominent jet manufacturer, MiG, also presented its latest drone model “Skate” - named after the marine animal. The drone is said to be an improved stealth aircraft with combat capabilities. “Skate” is catapult-launched, and does not need a remote pilot, as the built-in software allows it to operate in automated mode. The design bureau says it is at the same time working on detection technologies which would enable the Russian army to intercept any drone species in its airspace. Other unmanned hardware at the fair included multipurpose robotic tanks which can travel at a speed of 80km per hour, work in groups, and operate in standalone mode. An innovative robot-mine hunter developed by a sixth grade school student was also present. Not only can the lightweight ballistic armor vest developed in the university’s labs withstand a shot from a sniper rifle, it is also said to be superior to all classic kevlar vests. If hit by a bullet, the special material of the vest bends inside for three to five millimeters, instead of the usual two to three centimeters. According to the developers, the vest deflects a projectile and shrugs off all or most of the impact force, ruling out blunt force injuries. Another game-changing technology presented by Bauman MSTU was a protective cloth made of a special nanoscale material. Despite being light and thin, the university-developed armor is said to be able to withstand an explosion of a 250 kilogram bomb, serving as an ideal cover for military hardware and soldiers. A tent made of such nanomaterial can deflect bullets of a large-caliber machine gun, while a trivially looking ‘nanobag’ will hold a kilogram-strong explosion without being torn apart, the presenters told onlookers at the fair. Several prototypes of humanoid robots also attracted the visitors. A talking android who greeted Russian Defense Minister Sergey Shoigu on his arrival was of particular interest to those attending the event. Shoigu reportedly ordered several of the fair’s exhibits to be taken for army tests, and announced defense procurements for some of the design bureau models already tested. However, much of what the defense minister reviewed during the event remains undisclosed. The reporters noted that a large portion of the new hardware and technologies could have been placed in a separate exhibition area that ordinary visitors were not allowed to enter.